OVERVIEW OF STORY: A Terrorist Cell was arrested in Britain and charged with conspiracy to create fear, panic and disruption against unspecified targets. They were charged for plotting against the children of America, grandmothers, grandfathers, mothers, fathers, uncles, aunts, brothers, sisters and the unborn. An unspecified target is anyone of innocence. But besides the fact they had radioactive material plans, explosives and other plots to destroy and maim America's financial institutions, they were intent to bring the Beast of Terror back to haunt America. How can you be your own Scotland Yard to fight Terrorism within yourself and your loved ones? Find out. GROUND ZERO PLUS 1073 DAYS--New York, NY, Wednesday, August 18, 2004--Those who question that Terrorism is all about Fear, Intimidation and Complacency need to take a second look at Britain’s Terrorism Act. officials of an Al Qaeda Terror Cell, with conspiracy to murder. The alleged cell had in its possession information on financial centers in Washington, New York and New Jersey. 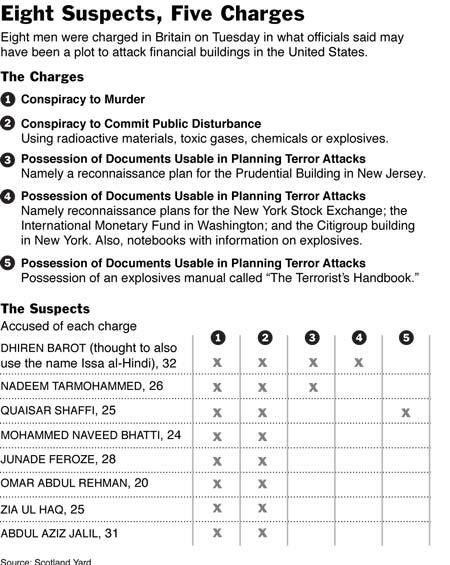 In addition to charges the men violated the Terrorism Act, they were also charged with conspiring to use “radioactive materials, toxic gases, chemicals and explosives” to cause fear, panic and disruption against unspecified targets.Among those arrested were alleged senior Al Qaeda officials, reports the New York Times. If there truly is a Beast of Terror—a force within and without that seeks to cripple human character and morality so that it is willing to injure, maim and destroy the innocent for purely selfish reasons—then the ultimate power of that Beast is about inducing fear, panic and disruption upon unspecified targets. Fear is fear. It is the threat of the unknown, the anticipation of something devastating. Some say the acronym for FEAR is False-Evidence-Appearing-Real, and they may be accurate. People who live in Fear believe the threat is true even if 'it' hasn't happened yet. A person who believes he or she is a victim of life’s hardships lives in Fear of being victimized again. He or she often never breaks out of that Beast of Terror prison. Many such people live and die unhappy lives. The shadow of their own Beast of Terror never lets the sun shine. Adults are usually reflections of their childhood. A child who Fears he or she isn't smart enough, good looking enough, popular enough, loved enough, may be digging more than a rut. That rut can turn into a grave, or a dank cave where the odious odor of the Beast of Terror lurks around each corner. The child grows to learn panic from fear. Panic is nothing more than Intimidation. When the Bully Beast’s Shadow casts it pall on society, people run, scream, shout, fall apart. The British understand that Terrorism isn’t just about the release of bombs or radioactive materials, but about creating in “unspecified targets” a panic based on fear. It’s like the analogy that we all enjoy free speech in America, except when we yell in a crowded theater, “Fire! Fire!” when there is no fire, and we cause a stampede that recklessly endangers the lives of others. 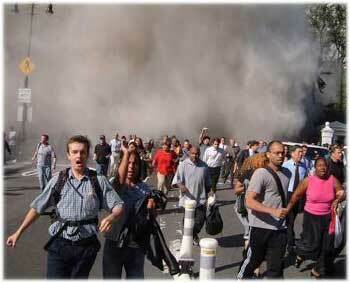 I remember witnessing such panic on September 11, 2001 at Ground Zero. I was with a small group of people standing on a corner a few blocks from the World Trade Center looking up at the burning Twin Towers just before the buildings collapsed. The group I was part of was shrouded in a reverent silence as we prayed for those leaping from ninety stories high to their deaths. But that quiet, shocked obeisance all changed when the buildings exploded. People screamed, shoved and ran, stumbling and pushing to escape the debris raining down. Some people froze; others had glazed eyes like stampeding animals, willing to crush anything in their way. Panic takes on a special nature when it is incited by Terrorists. It becomes deadly. The final British charge against the suspected Terrorist is worthy of a hard look: “to cause…disruption against unspecified targets.” Disruption equates to Complacency. Complacency is the disunion of one’s beliefs, goals, and purpose. When citizens turn the safety of their lives and children over to government, or to anyone for any reason, they risk the safety of their independence. They become sloths, and then slaves to the will of others. Their faith and resolve in their own selves becomes disrupted. It becomes time to point fingers, as the 9-11 Commission Report sought to do. “It’s your fault…it’s your fault…” scream the Complacent who seek to blame everything above them for their own plight, or, to dodge their own responsibility. Disruption ultimately means the fragmentation of values, the scattering of the whole into parts. A Terrorist bomb exploding in a crowd sends body parts flying. A person who “gives up” or believes he or she “has no chance” or that he or she isn’t “worthy enough” fragments their soul, chops it into pieces and scatters it to the wolves of the winds. Of what constructive value are the charges against the suspected Terrorists in Britain and our lives here in America? There is little if we aren’t looking through Vigilant glasses. But if we put the Glasses of Vigilance on, we see the dramatic reality of a Terrorist cell in Britain plotting to employ radioactive materials, toxic gases, chemicals and explosives against our financial institutions and, as part of that process, against our children, loved ones, neighbors and nation. To see the real power of the Terror Threat requires an introspection into what we must do daily to protect ourselves from fear, panic and disruption. Those who don’t see the internal nature of Terrorism miss the fact that Terrorism’s real radioactivity stems from inside our dark caves…that place within human evolution where our own Fears, Intimidations and Complacencies feed our own Beasts of Terror. We who are blind to examining the viscera of Terrorism pay no heed to the idea we may be breeding Terrorism in our children and loved ones by not neutralizing our own internal Terrorism Cells. When we neglect to check fear, panic and disruption, we allow it to fester. We ignore that our children and their children and their children’s children will inherit what we pass on, and if we pass onto the next generation Fear, Intimidation and Complacency, then the odds of it flowing onto the next generation and the next are high. But if we understand that Terrorism can be stopped only from the inside out, then we look at the charges against the Terrorists in Britain as charges against ourselves. We realize that if we are not careful, we can become prisoners of our own Fears, Intimidations and Complacencies—as so many have before us. To cut the legacy of Internal Terrorism, we need only take the Vow of Vigilance and practice it daily—not just for us, but also for the future generations. We need to be our own Scotland Yard and hunt down those Terrorism Cells that tend to breed in the nests of our Fears, our Intimidations and our Complacencies. 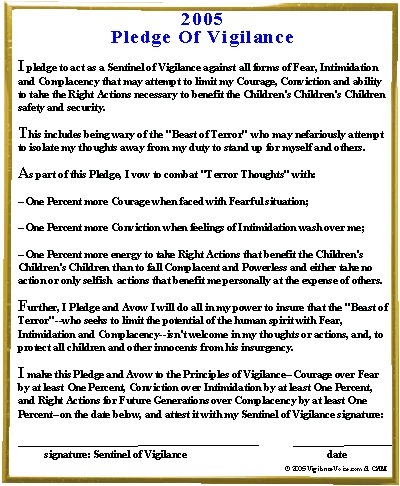 In a way, we need our own Terrorist Act, a Pledge of Vigilance to never concede to the Beast of Terror’s power to threaten us without our knowledge. We must never doubt that Terrorism is plotting now, in some place, in some way, to steal from us and our children the Right of Security…the Right of Safety…the Right of Freedom from Fear…Freedom from Intimidation…and Freedom from Complacency. Put Terrorism behind bars….Take the Pledge of Vigilance today.